The ascent of Turkey, a nation of 74 million straddling Europe and Asia, contrasts with the decline of Greece, its centuries-old adversary. The Turkish economy, which expanded 9.6 percent in the first nine months of 2011, is forecast to grow more this year than anywhere in the European Union, while the Greek economy is expected to shrink 4.8 percent. National Bank of Greece SA (NBG) has earned more at its Istanbul-based unit Finansbank AS (FINBN) since the financial crisis erupted in 2008 than it did in Greece. “It’s great that Greece is back to its privatization program -- the physical proximity of Greece to Turkey will be very important,” Turcas Petrol AS (TRCAS) Chief Executive Batu Aksoy said in an interview at the investor meeting with Greek officials. Greece says it plans to raise 50 billion euros ($66 billion) by 2017 by selling or renting assets including water utilities, ports, gas companies, regional airports, postal services, tourism facilities and roads. Global Yatirim Holding AS (GLYHO), an Istanbul-based company investing in energy and infrastructure, is interested in bidding for operating rights to “large” Greek seaports and is in talks with international operators for partnerships, said Adnan Nas, executive board member at the Istanbul-based company. Greece will auction two seaports by December this year, Panos Protopsaltis, the country’s privatization coordinator, told today’s investors’ meeting. Operational rights will be around 35 years, he said. Greece will establish a regulatory framework to sell the Piraeus and Thessaloniki ports by September, according to an International Monetary Fund report published March 16. The government in Athens has also asked for expressions of interest in the sale of gas supplier Depa SA and gas-grid operator Desfa SA on Feb. 29. The sell-off program continues with sports betting company Opap SA (OPAP) and the country’s biggest refiner Hellenic Petroleum SA (ELPE), according to the IMF report. Greece expects to raise 19 billion euros from asset sales by 2015, Protopsaltis said. About 90 percent of the assets are in energy and real estate, he said. Greek assets up for sale are not “appropriate for private equity investors” as the government needs long-term investors, he said. Prime Minister Lucas Papademos missed his target for asset sales last year, selling 1.6 billion euros compared to a goal of 5 billion euros. The sales “would save Greece about 1 percent of gross domestic product per year in interest,” the IMF said. However, meeting the target “may take considerably more time” than estimated given “weak market conditions, uncertainties about Greece’s near-term prospects and the time needed to prepare the assets,” it added. The asset sale program will help the ratio of debt to gross domestic product in Greece to fall to 116 percent in 2020 from 165 percent in 2011, so long as the nation’s “ambitious” program to overhaul the economy is implemented, according to a report posted on the website of the European Union’s executive arm last week. The EU approved a second Greek bailout of 130 billion-euro ($172 billion) on March 14 after the country agreed to spending cuts and structural changes. That followed a first rescue package agreed on in May 2010. National Bank’s reliance on Turkey shows how the tables have turned for the countries, which fought four major wars since Greece won independence from the Ottoman Empire in the 19th century. 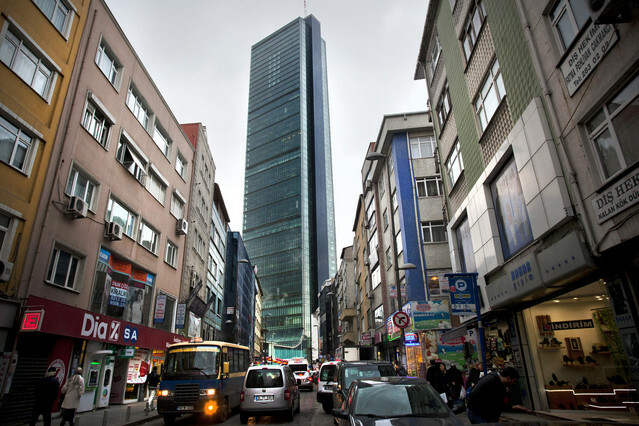 National Bank is worth 2.5 billion euros compared with Finansbank’s 9.76 billion liras (4.1 billion euros), according to the companies’ share price.